My Receipes: Can I use this leaf???? Hi guys, I got this vegetable from my backyard. I am not sure whether I can use this leaf for cooking...Can You please help?????? hai vidhya...is that vegetable is turnip..?.......i have no idea about leaves...sorry dear.. If that is a turnip, the turnip greens are delicious ! I grew up eating those and I wish they offered them here in UK. 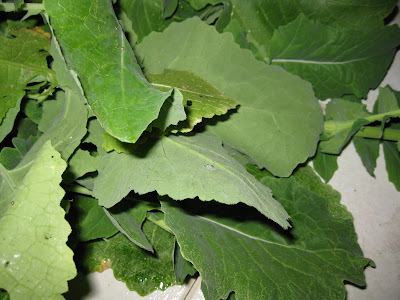 Never used this leaf...i have no idea..sorry dear..
hi ......i am first time here...nice space......yes these leaves are good to eat........make dry stir fry ( bhurji) or stuffed paratha with it.they taste somewhat like radish leaves. It's a turnip and those are turnip greens. They use a term here "cooked down" because they ae tough. You saute them and then put a lid on the pan to cook them until the are very soft. 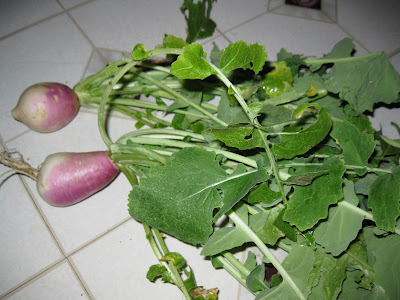 If those are turnips, then yes :) Here's a link that claims that they're edible. As asha said leaves are gud to eat.i prepared radish leaf sabji.It is tasty if you wish to try this leaf u see my method .it is really a very healthy recipe. Turnip leaves are very delicious. I live in the deep south in the USA and they are a staple in our diet here. However we don't saute' them. We cut the turnips off first and wash and cut them up. Place them in a pot of boiling water with some sort of smoked meat. (smoked turkey or pork is what we use in the south. )Turn heat down to medium and cover. Trim the stems from the leaves and wash them thoroughly and check the leaves for any foreign objects (ie insects) cut the the leaves up and drop into the pot with the roots. Vidhya Hi.. Wow so happy you posted this! Can you make keerai with it? Like with little moong dhal? It may take more time to cook. Hi Vidhya. This is geetha aunty here. I have seen some leaves. It looks like turnip leaves. If this is so, u can cook like our usual Keerai sundal. I will write about it in my new blog site at http://kitcheninmyhome.blogspot.com It will not give a bitter teaste. If u think so, u can add a little bit of sugar after the leaf is cook. Thats how we cook agathi keerai. Nice to see your recipe blog. U can also send comments about my recipe. Hi Vidhya. This is geetha aunty here. I have seen some leaves. It looks like turnip leaves. If this is so, u can cook like our usual Keerai sundal. I will write about it in my new blog site at http://kitcheninmyhome.blogspot.com It will not give a bitter teaste. If u think so, u can add a little bit of sugar after the leaf is cooked. Thats how we cook agathi keerai. Nice to see your recipe blog. U can also send comments about my recipe. but looks like mix of Onion and Palak.